Becoming a homeowner can be a great decision for many people, but it isn’t the right choice for everyone. Homeownership makes sense for different people at different stages of their lives. If you’re not sure whether you should make the move to buy your own home, it makes sense to consider both your personal and financial goals. Buying a home is one of the largest financial decisions most people make and it’s also a big personal decision. Some people buy because they want more space, the freedom to decorate and renovate, or because they want to live in a particular school district. Many people become homeowners because they want to build equity and have stable housing costs. On the other hand, some people rent for the flexibility of knowing they could move if they needed to, or because they’re not ready to take on the financial and maintenance responsibilities that come with homeownership, or because it is more financially advantageous in their circumstances. Here are some common financial considerations to keep in mind as you decide whether or not owning a home is the right decision for you right now. At some point, someone has probably told you that if you rent, you’re “throwing away” money. When people say this, they’re usually talking about the opportunity to build wealth in a home over time by building home equity. If you rent, you won’t build wealth in your home over time. Home equity is the difference between the market value of your home and the amount of money you owe on it. Essentially, it’s the wealth you hold in your home. The equity in your home grows over time as you pay down the balance of your mortgage. If the market value of your home increases, your equity will also increase. If the market value of your home decreases, your equity will also decrease. Buying a home is a long-term financial commitment and you will build home equity by paying down your mortgage over time. In the first several years of your mortgage, you build equity slowly. That’s because your monthly mortgage payments primarily go towards interest in those first years of ownership—not towards building equity. That’s why you shouldn’t depend on being able to sell your home to get out of a mortgage, especially in the early years. If you hold on to your home for many years, the share of your monthly payment that goes towards paying down the principal—and building equity—increases, and the share that goes to paying interest decreases. That means that the longer you’ve had your mortgage, the faster you build equity with your monthly payments. But remember: your home equity also goes up or down as the market value of your home increases or decreases. If you decide, or need, to move and sell your home within the first few years of owning it, it’s possible that after paying the transaction costs of selling the home, you will not have any more equity than you started with. In fact, you may even have less equity than you started with. Keep in mind that if home prices go down instead of up—as they did from 2007-2012—you could lose some or all of your equity, including the initial down payment, when you sell. You may have heard that owning a home will help you save money on your taxes. For many homeowners, that’s true. But for some homeowners, it’s not. The home mortgage interest deduction allows homeowners to deduct some or all of the interest they pay on their mortgage from their federal income taxes. You can only deduct your mortgage interest if you itemize your deductions. You have a choice when filing your tax return. You can itemize deductions—including the mortgage interest deduction—or you can use the standard deduction. If you take the standard deduction, you won’t get to deduct your mortgage interest. If you already itemize your deductions, you will most likely save money on your federal taxes by adding the mortgage interest deduction, and any applicable state or local property taxes , to your existing deductions. Factoring in the home mortgage interest deduction in making the decision to buy or rent is complicated. While the tax deduction may help make the monthly payment affordable, remember the amount of your interest will go down over the life of your mortgage, and so the tax deduction will also go down. For some buyers, having the deduction will help make the cost of the mortgage more affordable during the first years of the mortgage. For others, if the deduction does not equal or exceed the standard deduction allowed, there may not be a tax benefit. Consult a tax professional for more information. To make sure you’re making decisions based on actual numbers, research how much you can expect to pay each month for these additional costs. Add those monthly amounts to the principal and interest payment from your mortgage calculator to find out how much you can expect to pay for your total monthly payment. Property taxes and condo fees in particular, can add hundreds of dollars to your monthly mortgage payment. If you don’t have a specific home in mind yet, browse for-sale listings for similarly-priced homes in neighborhoods you are interested in. You can also visit the website of the county auditor, county assessor, or other local entity responsible for property taxes. We also recommend budgeting and saving up for inevitable home maintenance and repairs. These can cost hundreds or thousands of dollars depending on what you need to fix. If something important breaks—for example, a pipe bursts, and it wasn’t caused by something you are insured for, you will have to pay to get it fixed right away. For things like cracked windows, broken dishwashers or clogged toilets, you’ll either need to fix it yourself or pay a professional. When you rent, your landlord is generally responsible for the property and takes on the risks. When you buy, you take on these risks and responsibilities. 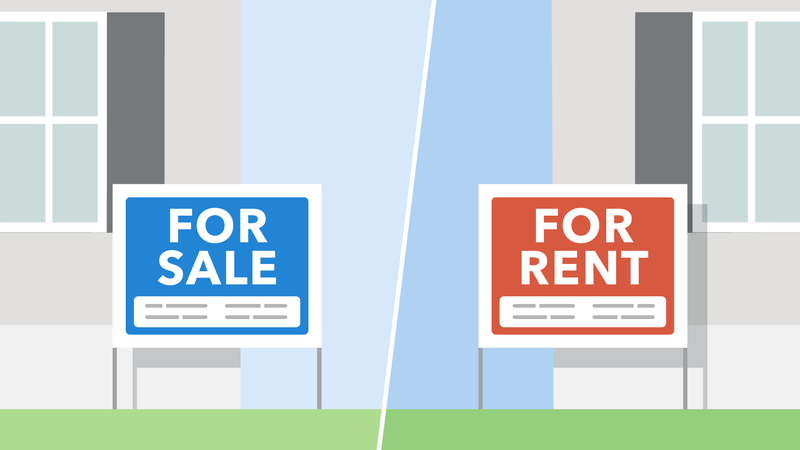 One resource you might consider using is The New York Times’ free “Is It Better to Rent or Buy?" calculator . This tool can help you assess the financial tradeoffs of renting versus buying based on your financial situation and the length of time you expect to own your new home. Remember that calculators may make assumptions about future economic conditions, such as the rate of home price growth. These assumptions can have a big impact on the calculator’s results. Try several different scenarios to see a range of possible outcomes. If you decide that now is the right time to buy, we’ve got a lot of information on consumerfinance.gov to help you get started. Get a copy of Your Home Loan Toolkit for an overview of the process and some tools to help you define what affordable means to you. Ask us questions. We’ll feature some of the most frequentlyasked questions on our blog this spring.